The TMF series of servo driven programmable Rotary Index Table is engineered to meet our customer’s vision of the ideal programmable Rotary Index Table that exceeds expectations. Our new standard for flexible or AC programmable rotary index tables is an innovative line, with zero backlash operation. These tables are built to maximize the potential of Motion’s flex technology with streamlined housing and dial plate to match. In order to increase the strength of our tables, the TMF Series was designed to be a completely flexible solution. This allows for a minimum of 4 over-sized cam followers to be engaged with the barrel cam at all times. 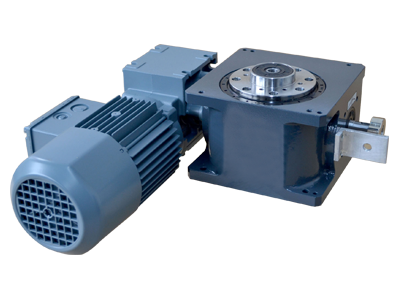 The power to rotate the tables are provided either by means of servo motor coupled to a gear reducer or AC motor with encoder, coupled to a gear reducer. They are manufactured to be identifiable by all robot brands and controls. The gear reducer is connected to the input shaft which is firmly connected to the internal barrel cam with no further internal gearing. The barrel cam in turn rotates the top dial through the cam followers with a zero backlash internal design. The output dial is mounted to a high precision four point contact bearing assembly, which is pre-loaded to eliminate any run out. It is completely sealed to eliminate intrusion from foreign particulate matter and fluids. 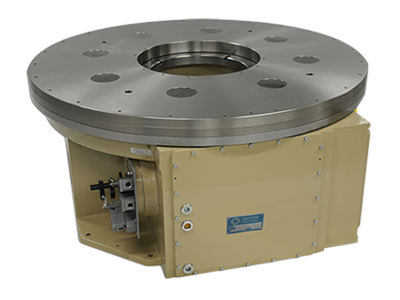 Rotary Index Tables transform a constant input drive motion into an intermittent output drive motion. 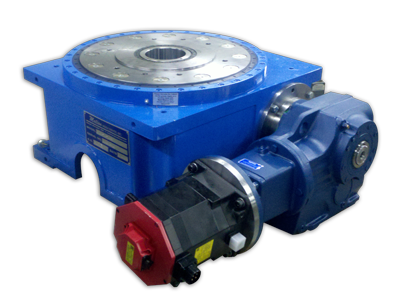 The intermittent drive motion occurs by means of a flame or inductively hardened and high accuracy-milled barrel cam. The use of mathematical laws of motion guarantees a soft, shock-proof and jerk free movement that has been optimally designed for its intended purpose. 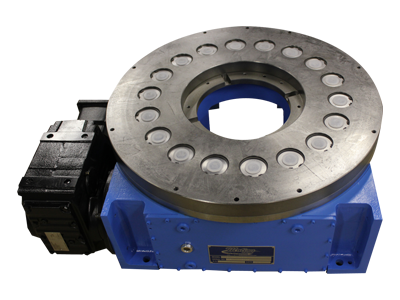 The designed assembly allows for accurate and secure mounting to the output dial which is also backlash free. The power is provided either by means of a three-phase brake motor via a gear reducer or by means of a chain-wheel or belt-wheel on the drive shaft of the tables. This is firmly connected to the barrel cam, without any further internal gear sets, and it turns the cam followers and subsequently the output flange. 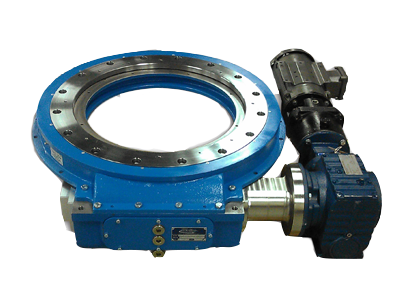 The output flange is mounted within a wire bearing assembly, backlash free of play (within steel ring – not in casting). The tables are completely sealed to eliminate intrusion from foreign particulate matter and fluids.